Heading southwest out of Boulder from Highway 12’s junction with the Burr Trail, you’ll pass the entrance to Utah’s Anasazi State Park and Museum. Just a little ways farther down the road and I was on the section of Highway 12 known as the Hogsback, although some people refer to it as Knife’s Edge, which seems quite appropriate. This section of Highway 12, which 70 years ago opened up Boulder to the more civilized world, travels along a high narrow ridge with steep cliffs on both sides. There is not a single spot along the highway that doesn’t offer magnificent views. But since it’s narrow enough in some places to see down both sides of its 2,000-foot high cliffs at the same time while driving, for safety’s sake I did most of my gawking at pullouts. The first time I crossed this amazing landscape was when I was visiting Escalante in the late 1970s and a local was showing me the sights. I was quite impressed – and the amazed emotions haven’t dimmed with the years. 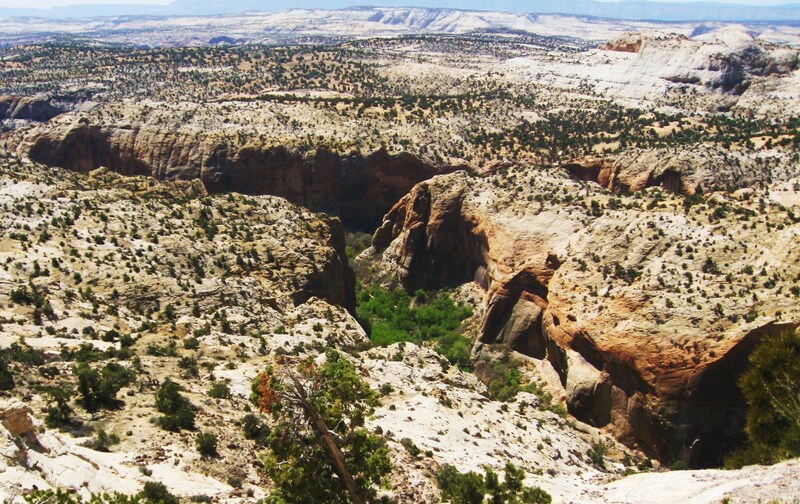 Since leaving Boulder, I had been traveling through the Grand Staircase-Escalante National Monument, which is spread across nearly 2 million acres of Southern Utah. Its creation in 1996 by Democratic President Bill Clinton, who announced the gigantic news in Arizona with the widowed wife, Norma Mattheson, of Utah’s former Democratic governor, Scott Mattheson, did not sit well with the state’s then Republican administration, nor the state’s large anti-environmentalist segment. The controversy was a boon, however, for this environmental reporter who was thrown into the thick of the battles. In the end, at least in my opinion, the protection of these awesome lands has benefited the state greatly with increased tourism in an area where jobs were scarce, and with transfer/trades of lands elsewhere to the state that have been more profitable in providing income for Utah’s school system. Escalante had certainly grown since my last visit about eight years ago, I noticed as I entered this town named after a Franciscan missionary who was the first to explore the area. And why not? It’s situated in some of the best scenery and hiking trails you’ll find anywhere in North America. 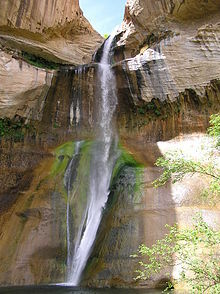 One of my favorites is the six-mile round-trip hike to Calf Falls,whose trailhead I had passed before entering Escalante. It has been a long time since I had seen the falls, but I could still recall the thrill at the end of three miles, mostly on a sandy path, of coming upon the 125-foot waterfall beneath which lay an inviting pool and shade trees. Egads! Here I’ve covered only 27 miles of driving in today’s blog, and already I’m in past-and-present landscape brain overload. Highway 12 will do that to you. And there’s more to come – tomorrow. Pat, your photos are AMAZING! 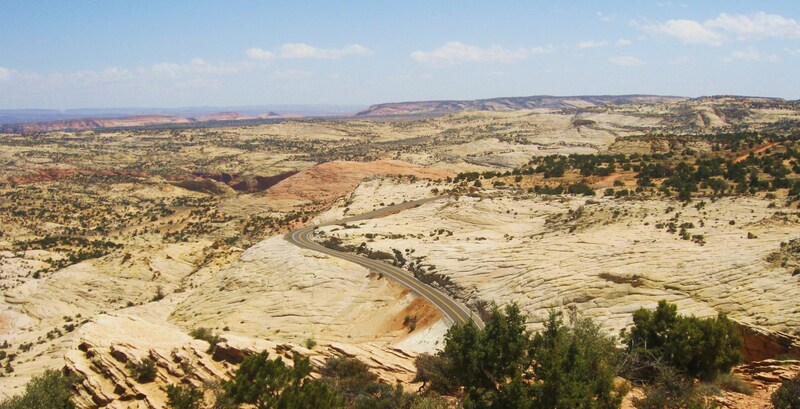 I’ve always loved road trips through the Southwest, but haven’t yet been as far up as Utah. Now I have not choice but to get that way soon. Wow. I am really enjoying traveling (through reading your blog) to places I’ve never been. I don’t always comment, but wanted to let you know I am reading. pretty pictures and description. love the waterfalls. great post.